Cusp of Normal: Oh! How Thank You! Hugs! I am being so crushed at work this week. Tomorrow doesn't look like it will be any different. I want to thank the ever-so-lovely Jamie for filling in for me today. I was wracked with guilt for not being able to tend to my blog for a few days. But Jamie swooped down upon my blog just in the nick of time. And Jamie? I totally have a crush on you too. Meet me by my locker after school where we will exchange friendship bracelets. Jamie has plans to visit Pittsburgh in the future (jealous?) to see her sis, so I'll give her a big old bloggy hug when she arrives. Until then... Jamie. Maybe you should order yourself one of these? Creepy pillow found by Everything I Like Causes Cancer. Hilarious blog. Adding it to my reader immediately. I guess I never realized that you were from Pittsburgh. I go to Duquesne (but I'm actually from California), and I like it out here. Whoa. 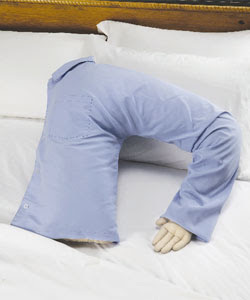 That is a seriously creepy pillow. Is that pillow for realsies? Just about died laughing. Sweet moses. Ooooh, and I'm checking out that blog! Sorry work is being lame-pants. Hope it gets better real soon! Ooh! Now it's your turn -- come to my blog and tell me more about your job! I wanna know! I forgot that you were in Pittsburgh. I'm thinking about visiting a friend there sometime this fall! Friendship bracelets? I was totally thinking those broken heart necklaces that make one. You can have BEST and I'll have FRIENDS. My hug me pillow can take the place of Amanda. Ben, No kidding! Just like a man--only without the pesky bones! Wishcake, does this mean you aren't ordering one? Sarah Marie, send me a quick e-mail and I'll tell you all about it. Jenn, Yay!!! I hope you let me know when you'll be in town. Jamie, Deal! But, I had a traumatic experience with one of those heart necklaces... a story for another time.